Why Buckle Up Your Pup? Seat belts save lives. Even low speed collisions can lead to fatalities, as unrestrained pets can be launched into dashboards or windshields injuring you, your passenger and your dog. The Canine Friendly Safety Harness is designed to distribute pulling pressure broadly across the chest to prevent your dog from being launched from its seat in the event of an impact at speeds of up to 30 mph. It leverages the braking power of your vehicle's seat belt that is designed to activate when there is a change in pulling pressure as low as one G-force. Your vehicle seat belt threads through the bartacked reinforced webbing loop on the back of the harness. 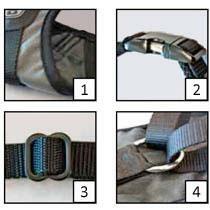 How is the Canine Friendly Dog Safety Harness Different? Crash testing the Safety Harness as a whole functioning unit under life-like simulations better predicts how the product will perform in the real world. • Canine Friendly has gone beyond component durability testing by subjecting the Dog Safety Harness to independent testing by MGA Research, an industry-leading auto testing facility located near Detroit, Michigan. • Crash tests using weighted mannequins and auto-sled simulation performed by MGA concluded that the Canine Friendly Safety Harness exceeds industry's Pet Safety - Durability Test standards for dogs up to 85 lbs. Crash test certified up to 85 lbs at 30 mph. The heavy duty quality of the Safety Harness is a result of using high-grade 1050D nylon fleeced lined chest panel (Image 1), high break strength aluminum buckles (Image 2), stainless steel O-Rings with 2,300 to 5,000 lb break strength webbing (Image 4), 2,200 to 2,300 break strength stainless steel slides (Image 3) and seat belt-rated thread that are all tested to be highly effective for its purpose. To measure your dog for size use a soft tailors tape while your dog is standing. Girth equals the widest circumference around your dog’s chest. Once your dog is measured please reference the chart to the right for size. 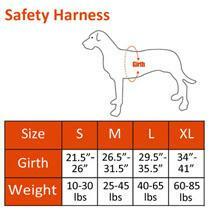 If your dogs weight falls outside the girth measurements please select size based on the girth measurement first. 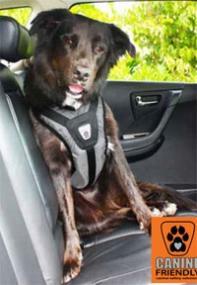 The Canine Friendly Safety Harness is available in sizes Small to X-Large.